I have yet another cute nail style to share today, this came out unexpectedly when I was trying one of my new China Glaze polishes, watermelon rind. 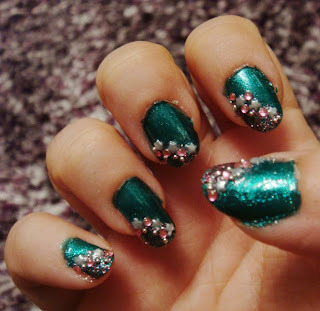 It is a nice deep green colour so I decided to combine it with some pink Anna Sui glitter using pink rhinestones and pearly stars to complete the look. In other news, if you like cute accessories, my friend Gatumi, owner of G.A.T.U.M.I. cyberlox & jewellery is having a give away to celebrate the opening of her youtube channel where she will be posting lots of make up tips. If you are interested check it out, all you need to do to enter is just subscribe at her channel and post a comment.